Worried about managing your inventory HDPOS smart, the best inventory management software, can run your business in a smooth and hassle free manner! - Many businesses struggle with inventory management and it is the root cause of most of their problems. Company dealing with products must have to keep the records of each an every items along with the Accounting of their Business which is known as Stock, which is also known as Inventory. With help of ASMS you will be keeping stock with minimum investment and controll over your dead stock(non moving stock) and save money. It is essential to know the stocks coming in to the company and stocks going out of the company. 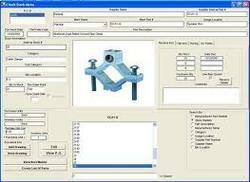 We develop customized inventory software as per client requirements. StockWiz is a stock management software that aims of being your personal trading diary. It helps u track and analyze your investments in the stock market. It is very easy to use and the moment u start using it , you master in its working functionality. Web Aspire provides a comprehensive Web Application Development & Maintenance services for medium to large enterprises. We have experience in developing applications in various models like Accounting software, Restaurant management, Hospitality management, Inventory control, HR & Payroll and many more. Your stock is your investment and we make sure you have accurate control on it. Get quick stock reports in print or email format. Taking stock auditis never so easy. Filter stock by cateogry, supplier, and other parameters. Taking product inward is simple, capture inward and challan information. We are having complete package for stock and inventory with accounting for retail store, hardware store, furniture and other trading sector. Increase customer satisfaction and gain a competitive edge with this robust, client-centric solution that spans all stockbroking and portfolio management functions.